Gilbert John Harris, known to family, friends and colleagues as G. Jack, was born and raised in Winnipeg, Manitoba. Jack graduated from Gordon Bell High School and was accepted to the University of Manitoba. In 1970 he received the Dean’s Gold Medal in Arts from St. John’s College and then studied at the University of Manitoba Law School graduating in 1973 with an LLB. Jack and Lynne were married in 1969 and moved to BC in the summer of 1973. Jack began his articles that year with a private law firm in Vancouver and then transferred his articles to the Burnaby Crown Prosecution Service, receiving his call to the Bar in 1974. He continued as a Crown Prosecutor in the City of Burnaby until such time as he established a private law firm with two other lawyers in Burnaby. He subsequently opened a law office in Abbotsford, where he practiced as a sole practitioner for many years. Jack went on to have a very prominent and successful law career as a criminal defence attorney practicing throughout the Lower Mainland and the province. In recognition of his achievements in his profession, Jack was awarded the distinction of Queen’s Counsel in 1985. Early in his law career Jack became an instructor in Criminology at UFV. He would often recall with fondness, the students and staff at the university and he was particularly proud to be a mentor to many. As much as Jack loved his profession he was an amazing family man and devoted his entire life to his wife, five daughters and grandchildren. Some of his happiest moments were spent at home working on his beloved acreage with his dog by his side. Jack was a great humorist who endeared himself to all who knew him, with his love of life and generous spirit. 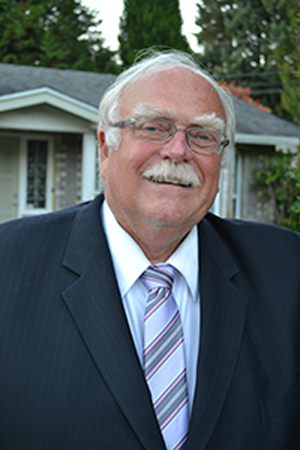 He had a strong sense of community and devoted much of his time, talent and hard earned dollars to better the City of Abbotsford. He passed away suddenly on March 12, 2014. G. Jack is remembered as a gifted speaker, friend to all and mentor to many. The University of the Fraser Valley (UFV) was very proud to award an honorary doctor of laws degree on G. Jack Harris Q.C. in 2008, in recognition of his service and excellence in the practice of law, and community involvement. Also, Jack was an instructor on a part-time basis teaching criminal justice in the classroom to students who enjoyed his anecdotes, humour and down-to-earth experiences. In early 2014, Abbotsford lawyers, Rob Dhanu of Dhanu Dhaliwal Law Corp., and Amrik Narang of Dhami Narang & Co. approached the Advancement office at UFV to discuss ways in which Jack Harris might be remembered and honoured. The G. Jack Harris Q.C. Memorial Annual Bursary was established in 2014 at the University of the Fraser Valley (UFV) as a result of this conversation and the founding generosity of the Fraser Valley legal community. The G. Jack Harris Q.C. Memorial Endowment Bursary awards is available to a student registered within the Criminal Justice program at UFV. Students must show genuine financial need.